An unforgettable experience for any student traveler awaits at Chicago History Museum, promising both education and fun. People often think of museums as boring places where artifacts are locked behind glass cases, and it’s more like reading from a textbook than taking a field trip. A museum should be an exciting, innovative place where students are engaged from the moment they walk in the door. They should look back on trips to the museum with fond memories. A trip to the museum can provide entertainment and learning, turning a visitor of any age into a student ready to learn something new. That’s where the Chicago History Museum comes in. This world-class museum showcases and interprets the dynamic past of Chicago and the U.S. through exciting and interactive exhibits. It is a must-see stop on any student trip in to the city of Chicago. At the Chicago History Museum there are so many things to do! For anyone visiting the city it is the perfect place to start their vacation. This museum gives the history of this glittering city in an original and captivating way and invites you back in time on a journey through the past. One of the temporary exhibits is The Secret Lives of Objects, created from the objects in the museum’s own storage rooms. Learn the never-before-heard stories of these remarkable objects, left alone for years in darkened shelves and hidden crates, that finally get their chance in the spotlight. 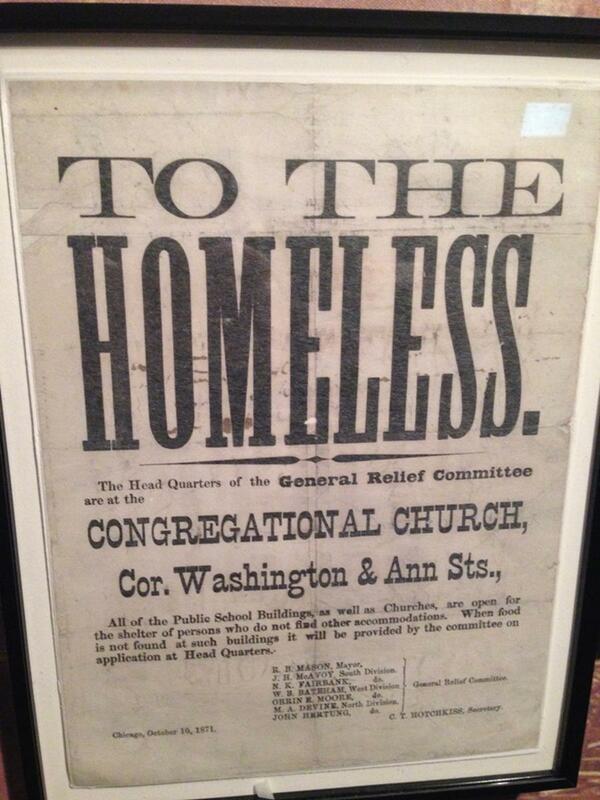 The objects featured are from around the city, across the country and throughout history. See the bamboo cane that helped Charlie Chaplin stand tall, look through the eyeglasses of Nathan F. Leopold Jr., one of Chicago’s most infamous killers, and view the gun used in the Harper’s Ferry raid. Another temporary exhibit is Railroaders: Jack Delano’s Homefront Photography. In 1942 the Office of War issued an interesting assignment for Jack Delano—document railroads and their impact on American life. Railroads were essential to our country’s victory in WWII and over the course of his assignment Delano took 3,000 images, more than half of which were at the nation’s rail hub in Chicago. Come explore the stories of the men who worked the rails at this fascinating exhibit which features Delano’s images and a train caboose. Pioneer, Chicago’s first railroad locamotive. Credit: Jeremy Atherton. Take a glimpse at the up-and-coming metropolis our 16th president once inhabited at Lincoln’s Chicago and Abraham Lincoln, two temporary exhibits. Lincoln’s Chicago features lithograph views of Chicago from the 1860s and portraits of Lincoln’s contemporaries. Abraham Lincoln follows one of our nation’s greatest presidents on his journey to save the Union and end slavery. This exhibit gives visitors an inside look into Lincoln’s life from his election and the turbulent years of the war up until his assassination. At Sensing Chicago, it’s all about the five senses and their uses. Use taste, touch, smell, sight and sound to explore Chicago and uncover its history. Catch a fly ball at Cominskey Park, ride a high-wheel bicycle and become a famous Chicago-style hot dog. 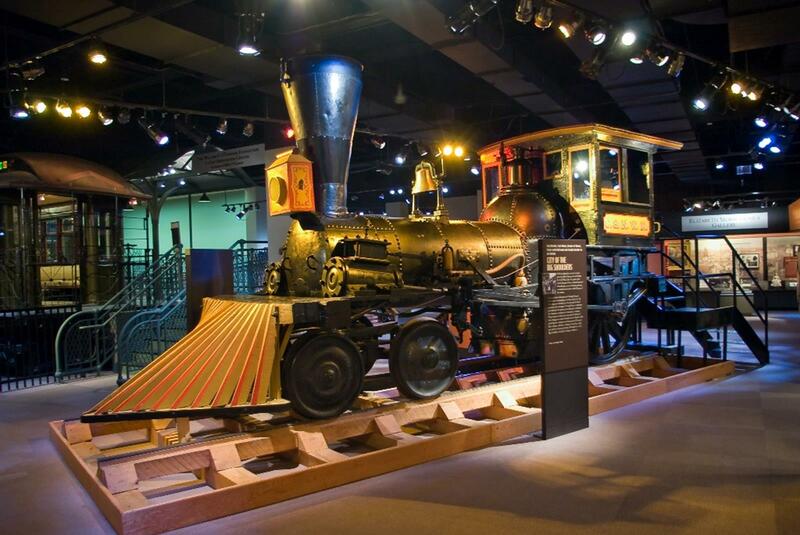 One of the most interesting exhibits at the museum is Chicago: Crossroads of America. This permanent exhibit is perfect for visitors at any age. It features a series of galleries that include artifacts, interactive features and multimedia presentations. 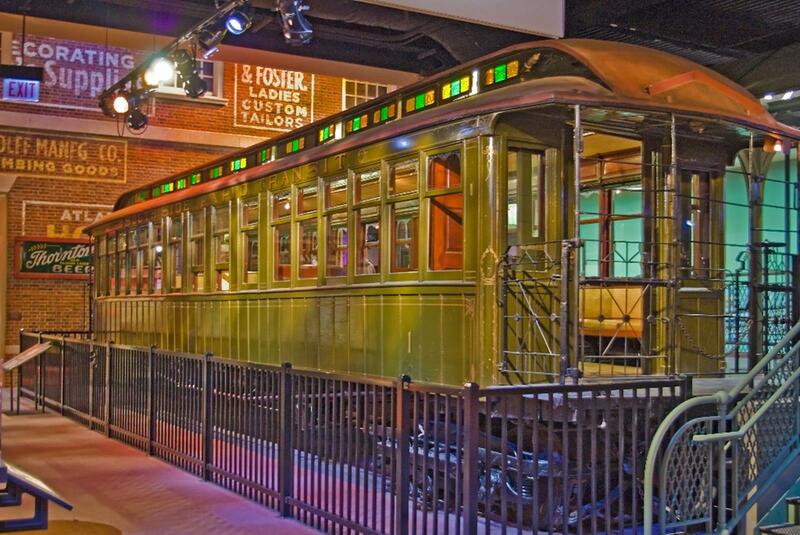 At City on the Make, one of the exhibit’s galleries, learn the history of Chicago’s economy. From the fur trade to the Union Stock Yards, this gallery gives an inside look at the evolution of trade. Climb aboard ‘L’ car No. 1 and see the Fort Dearborn model. City in Crisis investigates six crises that occurred in the city and the way Chicago responded. See a brass ship wheel from the Eastland disaster on the Chicago River and household objects burned by the Great Fire of 1871. South Side Elevated Railroad Car. Credit: JeremyA at en.wikipedia. Sweet Home Chicago is a multimedia presentation in the Crossroads exhibit that gives visitors the chance to meet the residents of the city’s neighborhoods. At Second to None visitors can see the many innovations that originated in Chicago. From manufacturing to science this gallery looks at the diverse inventions of the city’s inhabitants. Make sure to view the retro fashion in Marshall Field’s store window. At My Kind of Town explore world fairs, music and theater. Step inside a jazz and blues club and view sports memorabilia. Facing Freedom is a powerful exhibit that makes visitors ask, “What does freedom mean?” It is based on how American history has been shaped by conflicts over the meaning of the word freedom. It covers stories such as women’s suffrage, school boycotts, Japanese internment and the formation of unions. Learning should be about more than viewing objects in a room. And that is why Chicago History Museum is the perfect location for any student travel group. Through its interactive exhibits visitors can take a trip into the past and leave with memories that will last a lifetime. If you’ve taken a trip to the Chicago History Museum before, make sure to let us know about it in the comments below! Over the years, many people have viewed show caves as tourist traps. Others may have been just a bit wary of what lurked in those damp, drippy depths.